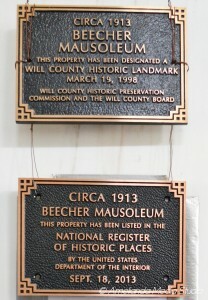 Efforts have begun to save and refurbish the Beecher Mausoleum. Sandra Thielman a descendant of Henry Thielman, who was instrumental in the conception and construction of the Mausoleum, has begun a movement to make the families of those interred in the building aware of the conditions that threaten their parents and grandparents’ resting place. Vandalism and weather have taken their toll. What faces those families is the inevitable need to contribute to the restoration and maintenance of the building or to move those who have been laid to rest there when the place becomes too dilapidated to be maintained. The facility is privately owned and the cost of maintaining it is too great for one family to bear. Thielman wants the descendants of the others encrypted in the mausoleum to be aware that an account for the maintenance of the building is open at the First Community Bank. Currently the account is controlled by Bill Saller. Thielman has indicated that she is willing to dedicate herself to the administrative activities necessary to support the facility. She plans a newsletter to keep all concerned families informed of the needs and progress toward the restoration of the mausoleum. Donation can be made to the Beecher Mausoleum Account at the First Community Bank and information can be obtained from Sandra Thielman at 1 (815) 728-8318.